Public Works also assists the City Planning Commission. All petitions and paperwork are distributed through the City Clerk. This application must be submitted in order to request a subdivision of land or for submitting a commercial site plan development. This is a checklist of all required documentation and submittals for a minor subdivision (5 lots or less) request. This is a checklist of all required documentation and submittals for a major subdivision (6 lots or more). This is a checklist of all required documentation and submittals for a commercial site plan. 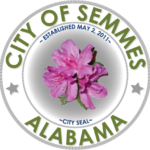 To request information regarding subdividing property, commercial building, and or any land use questions, please contact the Planning Department at the City of Semmes Public Works at 251-649-5752 or email Jasonfranklin@cityofsemmesal.gov.